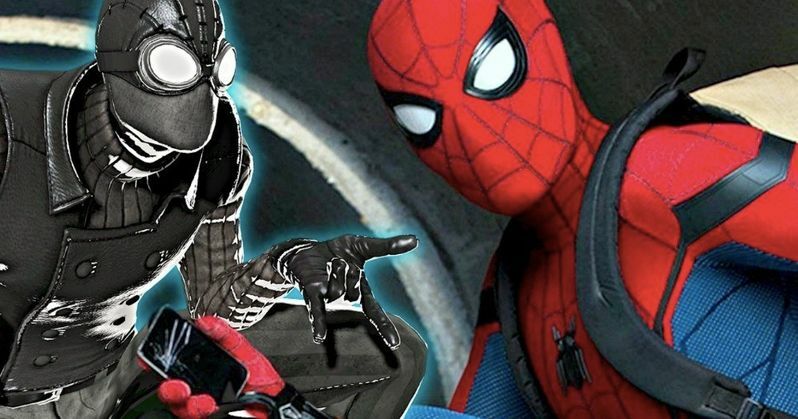 Better Look at Far from Home Stealth Suit Reveals Spider-Man Noir Design? Earlier this week, a leaked image from the set of Spider-Man: Far from Home popped up of Peter Parker in a black suit, which led to speculation that it was Peter Parker's Stealth suit. However, a new cleaner image has been released, and it now looks like it could be the Spider-Man Nor design. The sequel is filming all around Europe, and is currently in Venice, Italy after shooting some scenes in Prague. There have been quite a bit of photos from the set to make it online, but this latest look at the black suit is one of the more interesting images to have leaked. While it's believed that the Tony Stark suit will be the main one used in Spider-Man: Far From Home, Peter Parker will definitely have another suit with him, as evidenced by the latest leaked set photo of our hero clinging to the Ferris wheel. The previous image was too dark to make out any real details, but we now have a brighter look at the black suit, and it appears that Parker is wearing white goggles, which is leading to talk of the Spider-Man Noir design from the comics. Spider-Man Noir is an alternate version of the iconic character with a much darker tone. The story takes place in 1933 during the Great Depression and it's a part of the Marvel Noir Universe. With that being said, we could be looking at the Stealth suit, but with a tribute to the Noir design. The Stealth suit allows Peter Parker to warp the sound and light surrounding it, which makes him invisible. There has not been any official confirmation for either suit, but it certainly looks like a cross between the two aforementioned suits. Spider-Man: Far From Home is set to hit theaters a few months after Avengers 4 premieres, which has led to all kinds of questions from Marvel Cinematic Universe fans. Infinity War saw half of the universe, including Peter Parker, turn to dust after Thanos completed his mission. Fans are anxious to learn how Parker makes it back from that event to go and star in Far From Home. Out of the many theories that are floating around, time travel and alternate universes seem to be the most popular amongst MCU fans. Sony and Marvel Studios have been doing a tremendous job keeping Spider-Man: Far From Home details under wraps. We still don't have any confirmation who the main villain is, or who will be the actor to portray the character. It has been heavily rumored that Jake Gyllenhaal is playing the villainous Mysterio, but he has yet to be spotted on the set. However, he has been spotted a few times in England while filming was underway. While we wait to find out, you can check out the updated photo from the set of Spider-Man: Far From Home featuring the black Stealth suit below, thanks to Reddit.